SunPartner has developed ultra-thin, 90% transparent photovoltaic cells. Telephones and tablets, building and vehicle windows, billboards and greenhouses could soon generate electricity from any natural or artificial light source. The technology, called Wysips – “What you see is photovoltaic surface” – consists of an assembly of micro-lenses with a proprietary thin-film photovoltaic cell pattern. Four applications are under development. 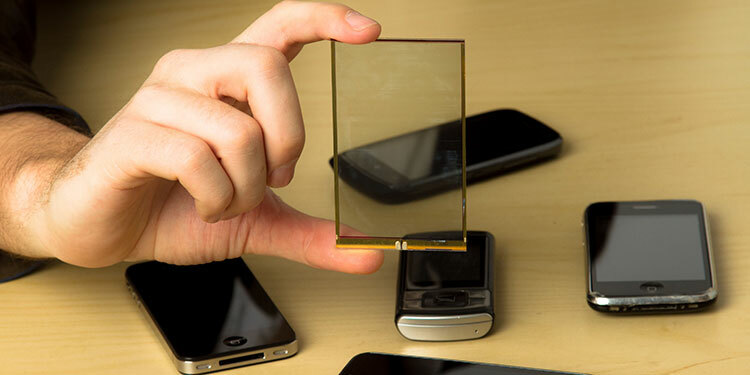 Telephones incorporating Wysips Crystal®, either above or below touchscreens, should reach the market next year. They will generate about 20% of their power requirements – enough for indefinite idle mode, emergency calls or offline functions such as playing music and showing boarding passes. The technology could make eReaders fully autonomous, eliminating the need for chargers. Wysips Cameleon® is designed for outdoor display applications such as billboards and signs; the first energy self-sufficient scrolling billboard, developed in partnership with Prismaflex, is slated to begin production this year. Wysips Glass® will enable windows to produce energy – including aeroplane windows that can power their own opacity controls, eliminating the need for pull-down shades. In the longer term, Wysips Textile® – a photovoltaic fibre – could be woven into the fabric of clothing and industrial textiles used in buildings, vehicles or temporary outside installations. The company’s business model is based on licensing. It has filed 30 patents during the past 18 months, and its patented transparency mechanism could also incorporate elements such as heating resistance wires, aerials or RFID antennae, promising a wide variety of other applications. SunPartner intends to become a worldwide reference in the field of solar energy.